Cruises and Whales in Alaska. Here you will find some Alaska Small Ship Cruises, also known as Alaska Yacht Charter, Small Ship Cruise Alaska, Alaska Inside Passage Charter Cruise or Alaska Yacht Charters. These Alaska Whale Watching Cruises offer unforgetable whale watching experiences as one of their unforgettable Alaskan experiences. Find custom cruises to Alaska departing from the Pacific Northwest that offer whale and wildlife watching, sport fishing, scenic excursions, gourmet cuisine and more all from the comfort of a luxurious cabin and spacious viewing decks. You can find these cruises at a price you can afford. Southeast Alaska Whale Tours: this page hosts information on companies offering tours directed at the Alaska cruise passengers that include whale watching and wildlife photography trips. When you see the Humpback, Orca and Beluga whales in one of North America’s Greatest Hidden Hideaways, the Alaskan Inside Passage, you will have seen the whale in it's unforgetable natural habitat. Along this inter-coastal route you will also have the oportunity to see the sea lions, seals and a multitude of other sea and bird life that makes the Inside Passage home. This is only some of the cruise tours you will find in Alaska's Inside Passage. Alaska Small Ship Cruises - Alaska Cruise on the small ship Discovery will provide unlimited wildlife experiences you can treasure for a lifetime. These extended scheduled 8 day cruises in Southeast, Alaska are for those who really want to see and experience all that Alaska has to offer. On our Alaska Cruises through the beautiful waters of Alaska's inside passage we'll walk in magical rain forests, visit Sea Lion Rookeries, watch Brown Bears feeding on spawning Salmon and spend time with the graceful Humpback Whale and return home with a better understanding of the world we share. See the massive glaciers of Prince William Sound, breathtaking scenery, towering waterfalls, and abundant wildlife including American bald eagles, harbor seals,sea lions, porpoises and more during this Prince William Sound cruise tour. Whale Pass Lodge all Alaskan wilderness adventures and tours. Escape the crowds and discover the hidden wonders of Prince of Wales Island with experienced guides and comfortable lodging. 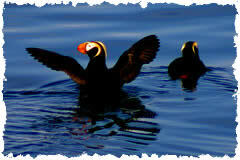 Full and half day guided wildlife tours departing from the Paradise Isles of Alaska. Set sail aboard a custom cruise along the scenic waters of Alaska. Spend time with the graceful humpback whale, catch king salmon, boil up a fresh crab, then sit back and watch as eagles soar above blue glaciers and ancient stands of evergreen trees. This is Whale Country, the protected inland waters of Alaska’s southern coast. Prince of Wales Island Whale Watching, drop in some shrimp and crab pots, enjoy the passing whale pods. watch Alaska whales feed and frolic, visit a sea lion colony, photograph sea otters, puffins, seals and sea birds. Let the folks at Alaska Log Cabin Outfitters put together a vaction to remember. Affordable, secluded, richly rewarding, Small Ship Cruises available from Craig and Klawock Alaska. 16 ft. Lund Skiff with Outboard available for rent. Here on Whale Watching Alaska you will find information on Alaska whale populations, distributions and over all health. Promotes environmentally responsible whale watching trips featuring gray whale, orcas, killer whale, humpback whale, beluga and whale pod photo.